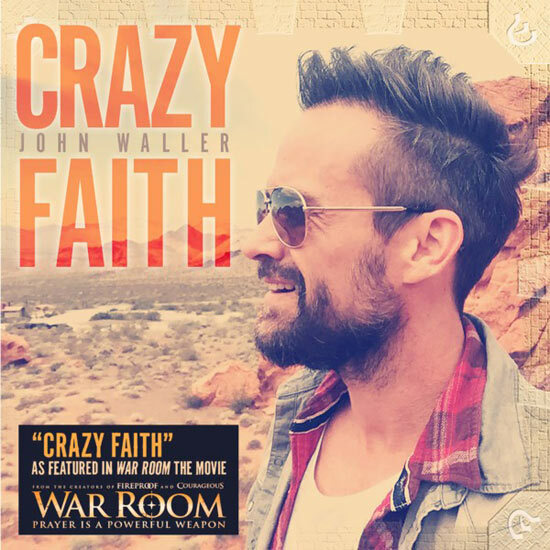 Recording artist and songwriter John Waller unleashes "Crazy Faith" as the first single and video from his fourth full-length album, Crazy Faith, which releases today (Aug. 21) to digital and physical retailers everywhere through City of Peace Media and Capitol Christian Distribution. Already garnering acclaim from radio programmers, fellow artists and more, plus receiving more than 20,000 views of the single's music video at https://www.youtube.com/watch?v=J3I9TVikxUE, the album's title track is further featured in the theatrical release, War Room. The highly-anticipated fifth film from Alex and Stephen Kendrick, the award-winning creators of Fireproof, Courageous and Facing the Giants, War Room will debut in theaters nation-wide through Sony Pictures Entertainment's TriStar Pictures August 28. Prior to the movie debut, Waller performed "Crazy Faith," as well as walked the Red Carpet along with the Kendrick brothers, at the movie'spremiere in Atlanta, GA yesterday. "I knew when I heard 'Crazy Faith' it would be the perfect song for War Room and would inspire people all over the nation!" exclaims Alex Kendrick as he prepares for the movie debut. In addition to the film, "Crazy Faith" is gathering significant attention at radio. "John Waller's song 'Crazy Faith' hits home with those moments in our lives where we've have had to make that leap of faith and trust God," says Rob Langer of "The Morning Cruise" on The Joy FM (Atlanta.) "John's awesome lyrics reaffirm that God is always with us when He calls us out of our comfort zone! It truly takes that 'Crazy Faith' in Him!" "John Waller's brilliantly catchy song, 'Crazy Faith,' calls us to more than just placing our trust in what is easy to believe, but to a level of faith in Jesus the world might call 'crazy'!" adds Centricity recording artist, Aaron Shust. Bill Lurwick, program director of Christian Music Broadcasters (CMB) Small Market Station of the Year WKNZ 88.7 The Bridge (Milford, DE), goes on to say that other radio programmers that haven't already added "Crazy Faith" to rotation, will, after seeing War Room, think to themselves, "That John Waller song 'Crazy Faith' from the movie is stuck in my head. Like big time. Why didn't I add it earlier when I had the chance, and all my cume that's now seeing the movie would remember that they first heard it on our station?" Playing the new single and other music from Crazy Faith while on tour, as well as performing fan favorites like "While I'm Waiting" and "As for Me and My House," songs he wrote that are featured in the hit movies Fireproof and Courageous respectively, Waller will also give away tickets to War Room during select tour dates this month. Georgia native John Waller first caught the attention of the Christian music community as frontman for the band, According to John. When the group disbanded, Waller and his wife Josee moved to Colorado where they helped launch Southlink Church. Though he had given up his aspirations as a recording artist, he began writing songs at Southlink that led to a new chapter in his ministry and signing a record deal with Beach Street Records/Provident Music Group. His major label solo debut, The Blessing, introduced a wider audience to Waller's music, earning a Top 10 "Faces to Watch" nod by Billboard (2007). He followed his debut with While I'm Waiting, which included the poignant title track featured in Fireproof. The music video to the title track of his most recent album on City of Peace Media, As For Me and My House (2011), has received over 2.5 million views on Youtube to date. With the release of Crazy Faith this summer, the next chapter for Waller is about to begin. Waller currently resides with his wife and nine children in Atlanta. For more information on John Waller and his touring, visit johnwalleronline.com or contact management at The Crossover Group, www.thecrossovergroup.com, or jack@thecrossovergroup.com.